WXXI’s Beth Adams talks to musician Rachel Flowers and filmmaker Lorenzo Destefano. When Rachel Flowers was born 15 weeks premature in 1993, she weighed just one and a half pounds. She lost her vision three months later due to a condition called retinopathy of prematurity. But when you talk to Rachel today, there’s no sense of loss, disability, or limitations. The 25-year old music prodigy’s world is vast and full of potential. By the time she was 4 years old, Rachel was playing Bach fugues on the piano seemingly with little effort. Now, with a flourishing music career, she composes her own songs and has befriended and sometimes performs with artists who have inspired her: Arturo Sandoval, Carl Palmer and Dweezil Zappa. Filmmaker Lorenzo Destefano first heard Rachel performing with a quartet at a club in Ventura, California in 2014. For the next two years, he filmed her life and work and made the documentary “Hearing is Believing,” which airs on WXXI-TV Friday, January 18 at 9 p.m.
Click on the LISTEN link above to hear an interview with Rachel and Lorenzo. Rachel talks about creating music and what inspires her. This story is part of Dialogue on Disability Week – a partnership between WXXI and Al Sigl Community of Agencies – in conjunction with the Herman and Margaret Schwartz Community Series. In the years since I launched the Rhythm Planet blog and shows I have never seen as enthusiastic a response as the one to our recent session with Rachel Flowers. The video of her in-studio rendition of an original composition called “Greg’s Favorite,” (which brought tears to my eyes) has topped 50,000 views on the Rhythm Planet Facebook page, and that number continues to grow. Equally adept at classical flute as well as acoustic and electric guitar, Rachel Flowers is a phenomenal musician—perhaps more than any artist I have ever encountered in my 40+ years at KCRW. I am moved and amazed by her stunning talent. So on this July 4th holiday, I wanted to share again Rachel’s own variations on America’s National Anthem. She first plays us the original, by Francis Scott Key before she proceeds to create her own improvisations in the styles of Mozart, Chopin, Debussy, Hungarian avant-garde composer György Ligeti (best known for his music on the 2001: A Space Odyssey soundtrack), minimalist master Steve Reich, and contemporary jazz pianist Taylor Eigsti. You must agree: Rachel Flowers is amazing. Hearing Is Believing, the new non-fiction feature from award-winning filmmaker Lorenzo DeStefano, introduces the world to the astonishing young musician and composer, Rachel Flowers. Born 15 weeks premature, Rachel soon lost her eyesight. At two she began playing every song she heard by ear, including Bach fugues. Starting her musical education at the age of 4, it was soon clear that the child had perfect pitch. DeStefano and his team have created a dynamic and engaging portrait of two years in the life of a tight- knit American family, a single mom and her two kids, living paycheck to paycheck in Oxnard, California, with Rachel’s stunning music as the soundtrack. The film revels in Rachel’s joyous and free-flowing love of song, illuminating the bonds of family and the divine mysteries of creativity. Among the great musicians appearing with Rachel in the film are Grammy winners Dweezil Zappa, Arturo Sandoval, and Stevie Wonder, Grammy nominated jazz pianist Taylor Eigsti, the late Progressive Rock icon Keith Emerson, Hawaii ukulele legend Benny Chong, and 50 members of the Santa Barbara Youth Symphony. Rachel is the recipient of many awards, distinctions, and scholarships, including a Stanford University Jazz Residency, Los Angeles Music Center Spotlight Awards, winner of the Ventura County Student Jazz competition, and private instruction in advanced improvisation through the Thelonious Monk Institute of Jazz. Rachel has performed for Ray Charles, Stevie Wonder, Quincy Jones, Clark Terry, Herbie Hancock, Herb Alpert, and Wayne Shorter. She is a very active part of several jazz lineups in California and is currently composing original songs and works for orchestra, jazz combo, piano, and voice. Born 15 weeks premature, Rachel Flowers lost her eyesight due to Retinopathy of Prematurity (ROP). When she was two years old, Rachel began picking up melodies from her musician parents and was soon playing every song she heard by ear. Starting her formal musical education at the age of four, Rachel spent the next 10 years studying at the Southern California Conservatory of Music. “Hearing is Believing” is an engaging portrait of a year and a half in the life of a tight knit American family, a single mom and her two kids living paycheck to paycheck in working class Oxnard, California, with Rachel’s stunning music as the soundtrack. As far as summer movies go, we’re just getting started. HEARING IS BELIEVING (June 20) – The star of this documentary is Rachel Flowers, who was born prematurely and went blind, but learned to play music and grew into a vibrant performer. The film follows two years in her family’s life. Hearing is Believing Productions thanks Tom Schnabel for including Rachel’s composition & performance of “Greg’s Favorite” on his May 5, 2017 episode of “Rhythm Planet” on KCRW. Listen at https://www.kcrw.com/music/shows/tom-schnabels-rhythm-planet/may-music-mix-jazz. Rachel’s segment begins @ 18:40 in this hour long program. “Rachel Flowers, born blind and weighing just one and a half pounds, surmounted all odds to become an amazing musical polymath. This is Rachel’s mainstream radio debut and we couldn’t be happier that it’s happened on Tom’s legendary program, also featuring Ahmad Jamal , one of Rachel’s favorite pianists, and other amazing musical artists like Trombone Shorty, Chris Potter and Christian Sands. opening June 16, 2017 @ Cinema Village in NYC & Laemmle Music Hall in L.A., through Foresight Releasing. Digital release from Gravitas Ventures on June 20, 2017, w/ Home Video release on July 11, 2017, also from Gravitas Ventures. The 2017 Summer Movie Preview is a snapshot of the films opening through early September. Rachel Flowers is practically a household name in Ventura County. The gifted multi-instrumentalist, who is also blind, has been on the cover of this very paper, has had a legitimate documentary film, Hearing Is Believing, made about her, and has appeared at a host of events. Even at a young age, she’s certainly an inspiration as to what one can achieve. But what about the actual music? Good news is, Flowers is first and foremost a composer and musician — and a damn good one at that. Playing all the instruments on her debut release, Flowers’ tastes are clearly eclectic, bouncing from near-classical ready-for-film compositions to flat-out jazz funk. It’s so diverse that within one of her instrumental songs — pieces that range from three minutes to 10 minutes — you can hear multiple genres. “Dawn Points” and “Memories of You” literally sound as if they could be part of a movie score for a feature film, while “Goes to Eleven” and “Aloha Part 2” would fit on the main stage at any major jazz festival. There are also more instruments happening than you can name, all of which are played by Flowers. So believe the hype: Rachel Flowers is a rare talent. If Listen is only the beginning of her recording career, it’s going to be fascinating to see where it leads. SAN LUIS OBISPO, Calif. – Rachel Flowers was profiled on 60 Minutes as a child and now performs around the world. 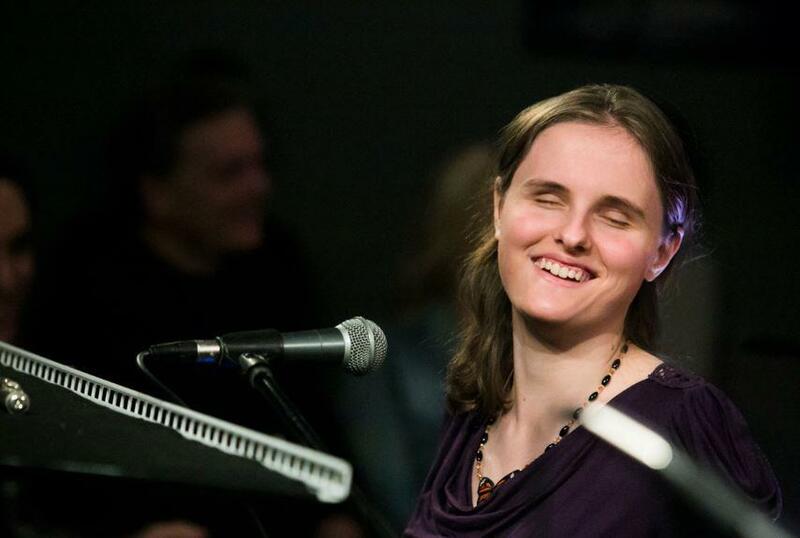 It is often hard to believe she has overcome blindness to become an amazing musician. That’s why “Hearing is Believing” is such a fitting title for the documentary about her. The new non-fiction feature was selected by the San Luis Obispo International Film Festival to be screened at the Historic Fremont Theatre on Sunday, March 19 @ 2:30pm. And film festival-goers will have a chance to see and hear Rachel Flowers perform live after the film. The film shows Flowers appearing with Stevie Wonder, Dweezil Zappa, Arturo Sandoval, Taylor Eigsti, Keith Emerson, Benny Chong and the Santa Barbara Youth Symphony. Producer/Director Lorenzo DeStefano and Executive Producer Patti Channer said making the movie was a labor of love. The festival hopes to sell out the theatre for the film & the Live concert. at the SAN LUIS OBISPO FILM FESTIVAL, followed by a LIVE CONCERT w/ RACHEL FLOWERS, both at the Historic Fremont Theatre in Downtown SLO. California, December 1993. Rachel Flowers, the eldest daughter of musicians Jeanie and Dan Flowers, was born fifteen weeks ahead of schedule. The doctors identified retinopathy in the premature girl and after some studies confirm that she will be blind. But her lack of sight was replaced by two ears, two perfect ears. At age 4 she played harmonies and complete movements of Bach and Beethoven by just listening to them a few times. Her ear is so exquisite that she cannot bear listening to something out of tune. The enjoyment of music, a gift for any child, is in her a magical, mystical triumph of sound over vision. First it was the piano and afterwards the flute. At the Southern California Conservatory of Music she became a classical flautist and jazz pianist. Then came the guitar, Hawaiian ukulele, bass guitar and saxophone. Here is a multi-intrumentalist, singer and composer. It is a journey that was not written and nobody knows where it will lead. In November 2016 Rachel released her debut first album, “Listen”, which includes eight songs written and arranged by her, mixing jazz and classical music, two of her principle influences: “I like the structure of classical, but jazz is how I feel the music. I like improvisation, complexity, interpretive creation,” says Rachel to OnCuba. The Jazz Plaza Festival recently presented some performances by this virtuosa instrumentalist who arrived in Cuba accompanied by filmmaker Lorenzo DeStefano, who also presented in Havana “Hearing is Believing”, a documentary about Flowers. We spoke with the director, who has had a special relationship with Cuba since the 1990s, when he first came to the island to photograph it from one end to the other. Then he returned to film a documentary about the famous Cuban group Los Zafiros (“Los Zafiros-Music From The Edge Of Time”) from the story of two of its living protagonists. In December 2016 he returned to Cuba with a new musical film to present, about Rachel Flowers. When did this idea come up? How did you meet Rachel? What moved you about Rachel’s story to decide to tell it in a documentary? Tell me about that first encounter with the country in the 90s and this other Cuba that you rediscover now. What does the attention of this trip particularly call you? Christian McBride, Terence Blanchard, Rachel Flowers, Arturo O’Farrill and the New York group Snarky Puppy were featured in the extensive billboard of Jazz Plaza 2016, held December 15-18 in Havana, Cuba. Accompanied by an already notable CV at the age of 22, young Rachel Flowers performed two very enthusiastically received solo piano recitals in the Abelardo Estorino Theater Hall of the Cuban Ministry of Culture and at Casa de Alba. Rachel also performed at 8 other satellite events during her 10 days in Cuba with such notable Cuban performers as Jazz Festival founderBobby Carcassés at his home and at a live Radio Taino broadcast @ Havana’s Cafe Miramar featuring Cuba’s renowned flautist Maraca. Rachel also performed with the quintet of power jazz fusion keyboardist Bellita, and with Canelas, the all-women’s Afro Cuban/Jazz ensemble founded by percussionist Zoe Funtes, both at downtown Havana’s famous La Zorra y El Cuerva jazz club. Flowers, a blind multi-instrumentalist and composer released her debut album, “Listen”, in late November “Is it jazz, is it classical, is it rock? Yes!”, it is announced on her web page (www.rachelflowersmusic.com). Continuing the tradition of her idols Keith Emerson and Frank Zappa, Rachel’s style challenges the borders between these and many other genres. Rachel Flowers amazing story and music will be introduced to the world in “Hearing is Believing”, the upcoming 2017 feature documentary by American producer/director Lorenzo DeStefano (www.hearingisbelievingfilm.com). While DeStefano and co-producer Patti Channer were in Havana the film was screened at the Fresa y Chocolate theatre, for students of Cuban artist Pedro Gonzalez Pulido at the Escuela Nacional de Bellas Artes San Alejandro, and in the Sala Caracol at UNEAC, the National Union of Cuban Writers and Artists. DeStefano is also the filmmaker behind “Los Zafiros-Music From The Edge of Time”, the very well-received 2007 film about Cuba’s much-beloved quintet from the early 1960s (www.loszafirosfilm.com), which received its world premiere at the Havana International Film Festival. Rachel Flowers, born weighing one pound five ounces, lost her sight not long after birth due to Retinopathy of Prematurity (ROP). But by two, Rachel displayed incredible musical skills; they led to her performing and writing music on multiple instruments, attracting stars from Arturo Sandoval to Dweezil Zappa, and the documentary Hearing is Believing. Ahead of a Saturday evening show at Medici’s Supper Club in Honolulu, she spent an hour in HPR’s Atherton Performing Arts Studio with HPR ATC Host Dave Lawrence. Team Rachel is super grateful to the over 400 people who voted for “Hearing is Believing” in the Indiewire “Project of the Week” campaign. We came in 2nd after a real horse race towards the end. These last few days have reminded me and my co-producing team how much we value your trust in us to tell Rachel’s story and bring her music to the world. We’re nearly 3 years into what I always figured would be a 4 year process – starting with the alliance I formed with Jeanie & Rachel in early 2014 to our anticipated commercial release in Spring 2017. With your help we’ve come so far in a relatively short time, and we have a completed film to show for it, one that is beginning its film festival life and winning hearts and minds one screening at a time. We look forward to sharing some exciting distribution plans with you as soon as they’re formalized. Meanwhile, thanks for being part of Team Rachel, and for the support you’ve shown in so many ways. Foresight Releasing / Hearing is Believing Productions, Inc.